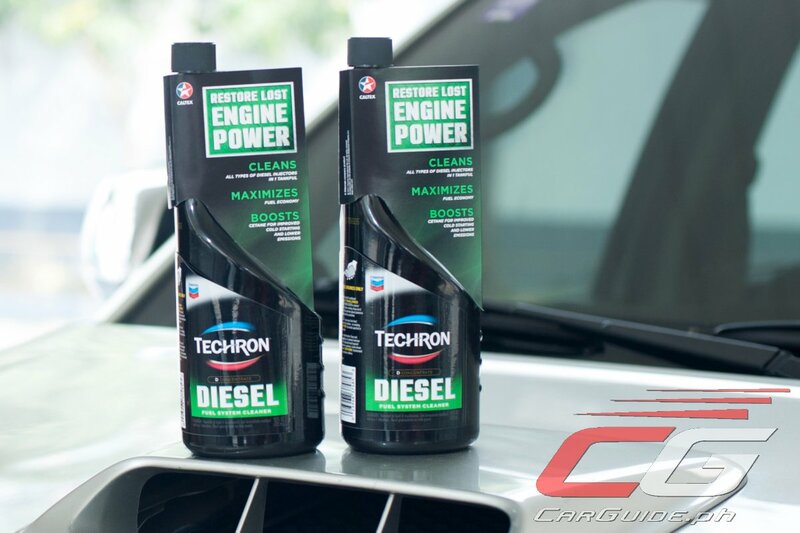 Almost three years ago, Chevron Philippines, Inc. (CPI), the marketer of Caltex brand of fuels and lubricants brought out its Techron fuel additive in a concentrated form. Promising to clean engines inside-out (we’re one of the many happy users), Techron Concentrate Plus has only been available for gasoline engines, until now. Today, CPI is introducing the Techron D Concentrate—an ultra-high-performance diesel fuel system cleaner. Just one 16-oz. bottle of Techron D Concentrate will last up to 5,000 kilometers (80-liter maximum fuel tank). Mixable with any brand of diesel fuel (ultra-low sulfur and bio-diesel included), it will quickly restore lost engine power, improve engine response and drivability, reduce engine noise, maximize fuel economy, and remove built-up carbon deposits in the entire fuel system. It also has a Cetane Improver that helps improves cold start-up and combustion. Techron D Concentrate can be used by both non-CRDI and CRDI equipped engines and is guaranteed not to harm exhaust treatment devices such as diesel fuel and particulate filters. Each time owners drive their diesel vehicle, carbon deposits can build up in the fuel system and suppress the engine’s performance. These deposits are found on the exterior tips of the injector, which affects the spray pattern of the fuel into the cylinder, and inside the nozzle spray channels which reduces the flow of fuel. Diesel vehicle owners who experience loss of power, increased fuel consumption and higher emissions may have inefficient fuel delivery because of deposits in the fuel injection system. In tests, Techron D Concentrate restored injectors that had only 20 percent flow remaining to 99 percent flow. The additive is also effective at removing internal diesel injector deposits, as shown in engine testing and collaborative work with OEMs. In addition, Techron D Concentrate delivers a high treat of cetane improver which functions by reducing the ignition delay period between first injection of the fuel into the cylinder and the start of combustion. This combustion enhancing effect improves cold starting, reduces white smoke on start-up, reduces engine noise, lowers particulates, hydrocarbons and carbon monoxide emissions, and reduces nitrogen oxides discharge from heavy duty diesel engines. “Caltex always aims to help its customers keep their vehicles at their optimal performance. With Techron D Concentrate, our customers will enjoy its benefits and precision clean technology feature to having superior clean engines. Our retailers will be able to provide an innovated solution to help their diesel engine-based customers. Techron D Concentrate is now available in the market with a promo price of P355.00 per bottle. Now, motorist can expect more with having superior clean engines,” said Hafiz Nasar, Finished Lubricants, Area Business Manager. Techron D Concentrate is available at Caltex service stations stations nationwide or via the online store, Lazada Philippines. It’s priced at P 355.00 as part of their special introductory price until March 31, 2018. Is this safe for vehicles under warranty? For Euro 2 and euro 4 engines? How do you use it sir, just pour the 16 oz into the fuel tank? It’s safe for all diesel engines says Caltex. How to use it? I’m inferring to how the gasoline additive is used. Simply pour the bottle into a nearly empty tank and then fill up. It should continue to work until you reach 5,000 kilometers. Thanks for the heads up. Will get in touch with them.